A large cluster of 1,200-year-old hanging coffins have been found in the Hubei province of central China. The mysterious tombs probably belonged to the Bo people. 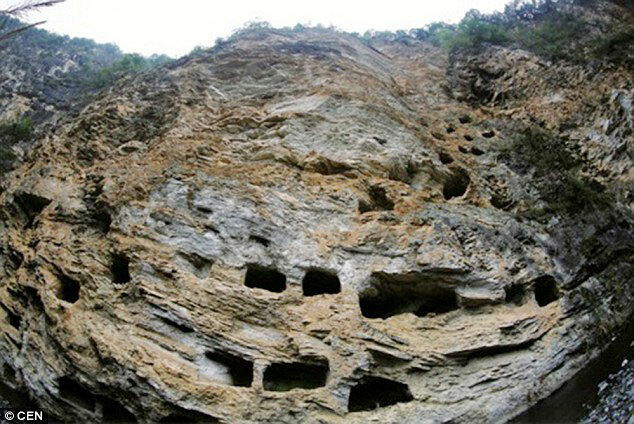 The wooden coffins were discovered in the so-called “Cave of the Fairies” by the people who now live in the village of Yanglinqiao. 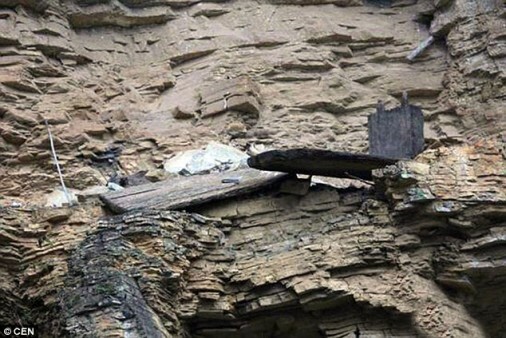 The 131 wooden coffins were placed in rectangular-shaped holes, up to 100 metres high and spread over 50 metres of the cliff facing a river in Zigui county. The unique burial custom is said to have protected the bodies from being eaten by wild animals. How the Bo people managed to transport the coffins onto the beams in the cliff caves still remains unanswered. However, similar coffins hanging from cliffs are found all over China. Yo Bo, Head of the Zigui Cultural Relics Bureau said the cliffs will be cleaned up and conserved, in order to be added to the list of China’s protected cultural heritage sites.